HVLS (High Volume Low Speed) Destratification Fans are particulaly applicable to buildings with high ceilings and are able to handle very large air volumes due to their large diameter blade rotation. The fans are fitted by hanging from a roof or ceiling. For large floor areas multiple fans are used - see each product for guidance on maximum recomended distance between fans. 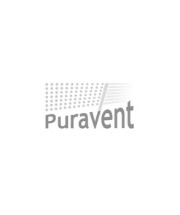 The Evel product range carried by Puravent are suitable for applications from relatively small commercial applications to very large industrial, warehousing and also indoor livestock applications.